North Cotswold Hunt demo and more fundraising! We went off to see the North Cotswold hunt on Sunday 24th July at their kennels at Kennel Lane in Broadway – where they had an open day – and to do a counter demo along with other locals and not so locals. To the 2 ladies who came up from Wiltshire you have our utmost respect and we were delighted to see you. An open day means that they tell big fibs to the public about how they follow trails and flush foxes to Flora the big NCH bird of prey. As she is normally wearing a hood we are not sure how she is supposed to catch foxes but hey ho! 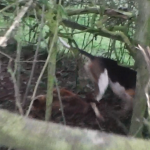 West Midlands Sabs have filmed the NCH putting down food for foxes where they have also been filmed hunting and one lady went to talk to the master about this after looking at our banners. Nigel Peel (Senior master and huntsman) arrived a bit late in the day though. 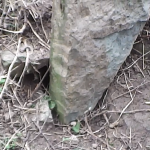 We have also seen the many setts blocked hard when the NCH are in the vicinity so were keen to point this out to the many tourists who always flock to the town this time of year. We also spoke to many about the proposed cull in the area. One lady was a local farmer and very opposed to it. An NCH member (surprise, surprise) said he was signed up to have badgers killed on his land . Many leaflets handed out and discussions had. Many of those pouring money into the Cotswold tourist industry were horrified that illegal hunting, sett blocking and a possible badger cull were going to be happening in the surrounding area in the near future. Meanwhile in Newent Gloucestershire Badger Office had set up by the lake to support the intrepid 100 mile challenge cycle ride. We arrived back to eat some cake and buy some wonderful Z16 jam. As a few of us are unable to join the main group of cyclists raising funds for the Badger groups next weekend we decided to go out around the Newent area. We took our mascots with us and as you can see they had great fun posing for us as we went past ten of the churches in the villages that are in the West Gloucestershire cull zone. The route took us just over three hours and we rode a total of 31 miles. Thanks to our efforts and the many folk who have kindly sponsored us for this worthy cause and we’ll have raised around £260 when all the money is collected in! Thank-you all! On the 16th July, Cheltenham saw a march for the badgers come through the town. Lots of people joined in on the way round and hundreds of leaflets were handed out. A couple of sabs from 3C spoke during the march, alongside Dominic Dyer and Pete Martin from the Badger Trust, Vanessa Gajewska from Wounded Badger Patrol and Nigel Tolley from United Active Badger Army. Thanks to everyone who came along or supported! 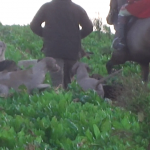 The Ledbury Hunt have been quick to distance themselves from the “alleged cruelty and malpractice at the South Hereford Hunt kennels” this week and have been sending out letters to locals in their hunt areas. 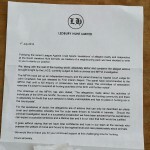 We’ve had a number of people mentioning these letters to us and managed to get a picture of one of them. It’s good to know that the Masters of the hunt “absolutely abhor and condemn the alleged actions” of the hunt which “can only be described as utterly cruel and defenceless” and that a custodial sentence and lifetime ban for the perpetrators, if found guilty, would be justified and therefore supported by the Masters of the Ledbury Hunt.